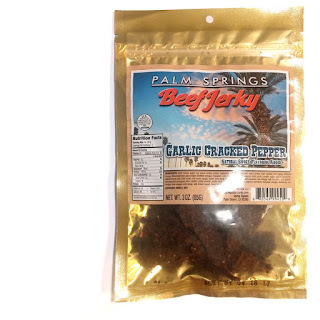 This "Garlic Cracked Pepper" is marketed as the company's signature flavor, describing it as a, "perfect balance of rich beef flavor, fragrant cracked pepper and perfect balance of garlic". Beef, brown sugar, soy sauce, worcestershire sauce, chili sauce, balsamic vinegar, seasoned rice vinegar, liquid smoke, spices. The first flavors I pick up is a moderate sweet, hints of worcestershire, and a vinegar tanginess. The black pepper starts to come in. 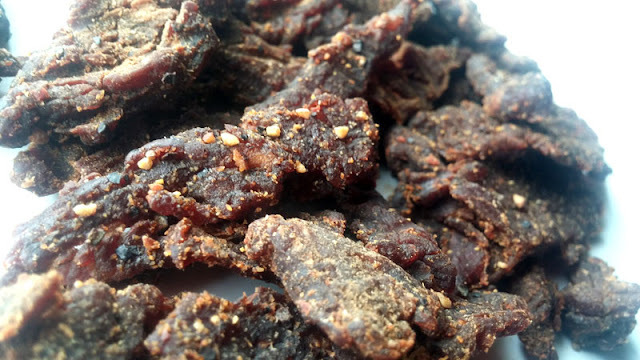 The chewing brings on more of the vinegar tang, along with garlic, and a light natural meat flavor. For being advertised as "Garlic Cracked Pepper", it holds up well. 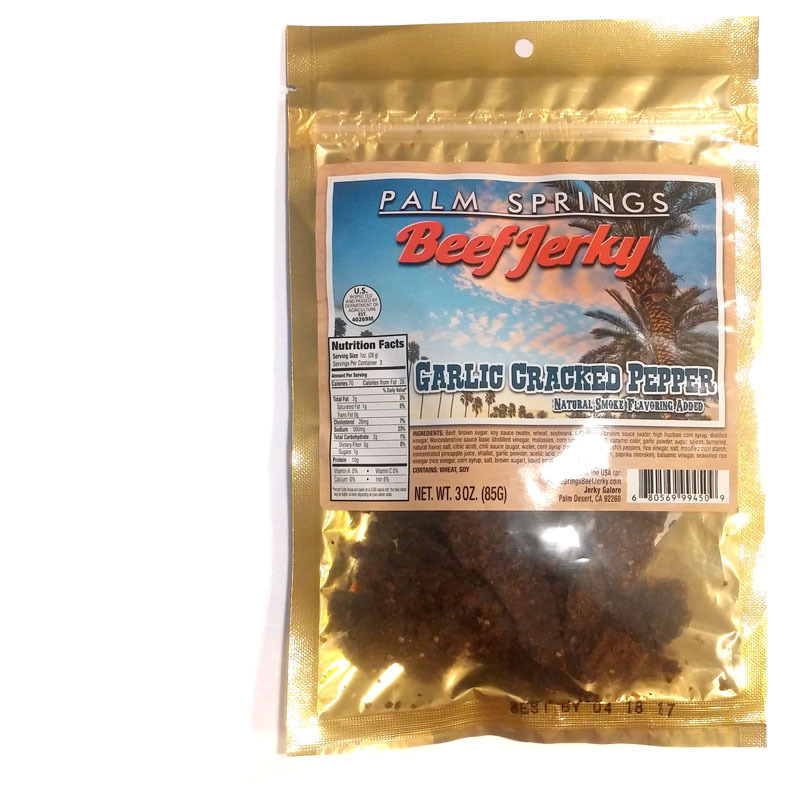 The black pepper grows in flavor with a sharp, freshly cracked piquancy while the garlic lingers with a soft savor in the background. The primary taste profile is largely a tangy, sweet vinegar laden with a sharp, black pepper and soft garlic. There's a light bit of heat from the garlic and black pepper, and a light natural meat flavor in the chewing. The meat consistency and chewing texture is excellent. This looks to be beef brisket, and as such has some stringiness, but not as much as other brands have. Otherwise, it chews very tender with minimal effort. It's lightly moist, and bursts with flavor. 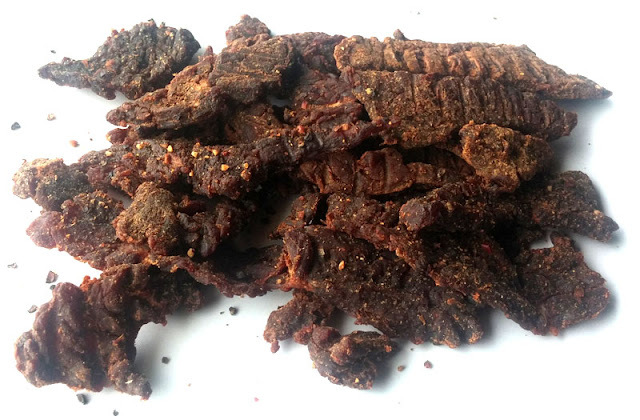 The chewing texture is that of soft steak. This is among the best jerky that I have found over the years. I tasted it for the first time last week and was very impressed and satisfied. But if you like the kind that you must chew, chew and chew...then this is not it. OK, the meat is good quality and the flavor is very fine...my only mistake was starting with the very hot habanero. I buy jerky constantly, at all places that I travel. I have no affiliation with this brand, but I want to endorse it and recommend that you try it.